In the wild, dolphins might use their skills in echolocation to navigate unfamiliar terrain or track down fish in dark -- but scientists in Sweden have discovered that these focused waves of sounds can also be used like fingertips on a touchscreen. 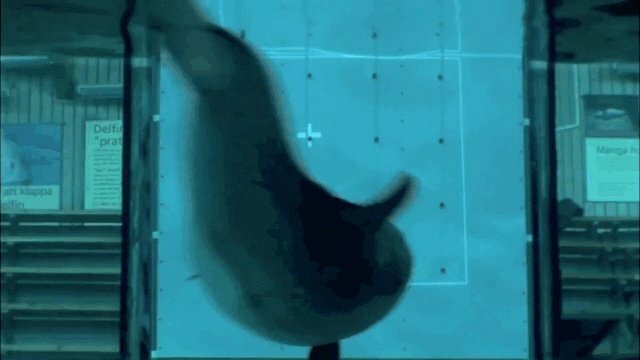 Researchers from Lund University have developed a one-of-a-kind computer input device for dolphins, called the EchoLocation and Visualization Interface System, or ELVIS for short. Using a grid of 16 microphones behind a screen, ELVIS allows dolphins to point and make selections by directing their sonic clicks towards projected symbols. This novel dolphin-computer interface is opening new doors for research into the animal's behavior, cognition, and intellectual capacity. In one of the first experiments involving ELVIS, dolphins were presented with the opportunity to select which type of seafood they wanted to be fed, essentially using the projection screen as a digital menu. And amazingly, the dolphins proved to be quite proficient with the device in making their meal selections -- suggesting that dolphins have a tech savvy that rivals our own.